← October Freebies — over $300 of free things we use all the time! 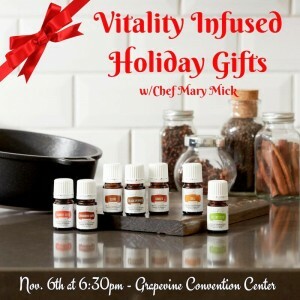 When: Tuesday, 6 November 2018 at 6:30 pm Where: Grapevine Convention Center 1209 South Main Street Grapevine TX 76051 You are not going to want to miss our last class of 2018 as we welcome our very own oily Chef Mary Mick to make delicious holiday gifts infused with Young Living Vitality Oils. 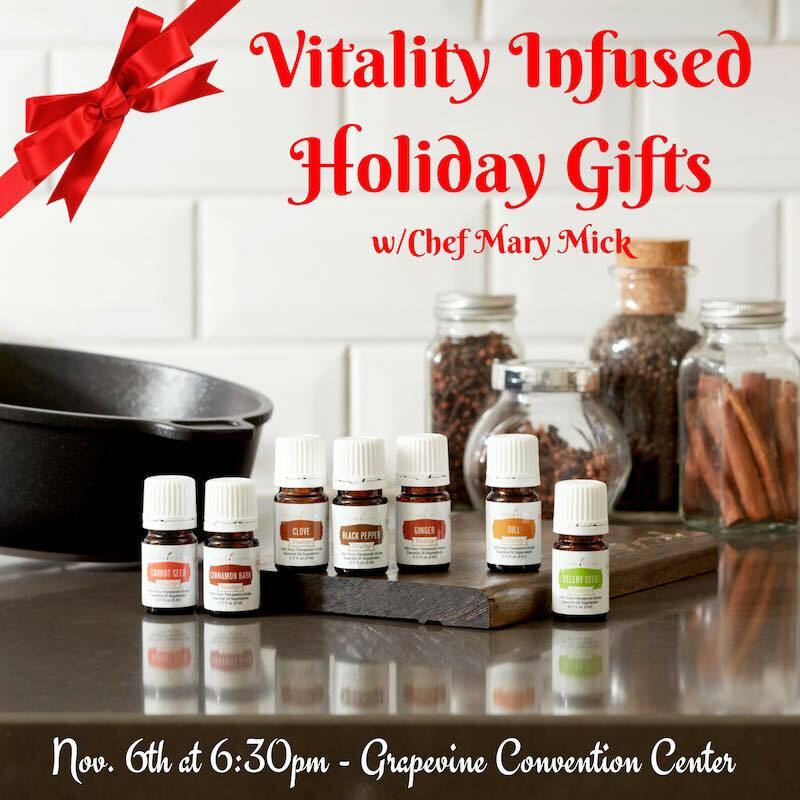 She will demonstrate simple, healthy and allergen-free gifts of YLEO-infused olive oils, sanding sugars and chocolate confections that will sure to be a hit with all who receive them! Mary will also show you ways to package them beautifully for the holidays. Prizes this night will include the gifts created by Chef Mary so be sure to get your spot before this class is sold out! In the spirit of being a blessing to others this holiday season, we will also have a donation station for supporting Hope for Justice through the YL Foundation. We will draw from those who donate (and live in the DFW area) for a FREE 2-Hour, In-YOUR-Home Culinary Coaching Session with Chef Mary! SO FUN!!!! Optional 2nd part of the evening: It’s Movie Night!!! We will pass out popcorn to nosh on while we watch the great 53-minute documentary “Rise of the Entrepreneur – The Search for a Better Way”. As technology accelerates, job security declines and income inequality increases, our family members are overworked and underpaid. Our changing economy has led to the rise of the entrepreneur – the fastest, most dependable and controllable way to become wealthy is to own your own business. This documentary gathers today’s best experts and thought leaders to forever change how you view work and wealth.